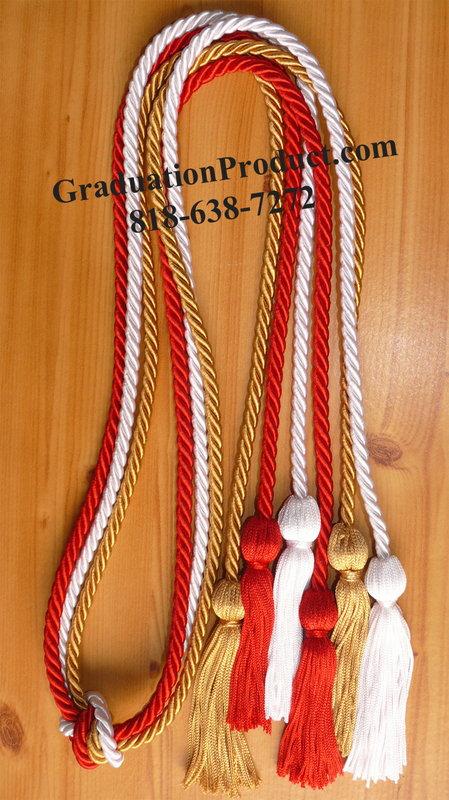 Description:Red Old Gold and White Triple Graduation Honor Cords Three, solid color Single Honor Cords tied together. Tassels are the same color as the cord they are on. Length: Standard length of approximately 5 feet long with 4 inch tassels on each end. Thickness: Approximately 3/8 inch. These are not the thin and cheap 1/4 inch diameter cords other companies are selling. Color: Click on drop-down list select color combinations. Customer Reviews on "Red Old Gold and White Triple Graduation Honor Cords"
Write you own review on "Red Old Gold and White Triple Graduation Honor Cords"